karaoke rentals buffalo ny is now “Karaoke DIY” Buffalo, NY & WNY! Great FUN for your next party! Karaoke Do-It-Yourself Buffalo NY — Karaoke is great for livening up any party or event. And now, you can host your own karaoke show, complete with music and microphones for your next party from DJ Johnny K! Serving the Buffalo, Niagara Falls, and Western New York area. All karaoke rentals buffalo ny now “Karaoke Do-It-Yourself” come complete with a 3200+ song Karaoke library of CD+G discs including Classic Hits, Oldies, Pop, Rock, Country and Pop Hits! Two microphones, request books & slips also included. We can hook up your ipod to these rentals for your party music too! BOOK TODAY and get a bonus song collection added to your DIY package! All Do-It-Yourself Karaoke packages include FREE delivery/setup/pickup within 15 miles of our office. Call (716) 472-9898 & Reserve NOW !!! This system is complete with more sound for larger parties. Extra channel available to hook up your Ipod, Ipad or mp3 player! Delivered and set up at your location. For larger parties and events that require a full sound system, ask about our complete Sound System/DJ Packages! More extensive collection of songs available by having a Karaoke Show hosted by DJ JOHNNY K for your next event! The DIY Karaoke can also be hooked up to your phone, tablet, MP3 player or laptop for music play. 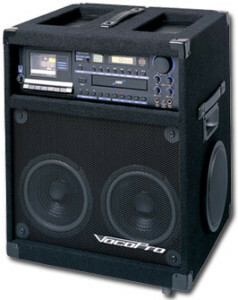 This is ideal for wedding rehearsal dinner parties where Karaoke and Music or dinner and/or dancing are featured. Ask about my DJ package for Wedding rehearsals and Jack & Jill parties! Check our availability or call (716) 472-9898 now to reserve a DIY Karaoke today! Advance bookings only. Dear Johnny K - Just a special thanks to you for helping make our wedding great. You did a wonderful job. Couldn't ask for a better DJ than you! Copyright © 2002 - 2019. DJ Johnny K Sound System. All Rights Reserved.